Another August, another year of classes! August and September mark the beginning of most college students’ semesters, and along with that comes the stress and anxiety of preparing for another year of homework, projects, reading, and exams. While it may not be possible to completely eliminate that anxiety, I have some tips that may help reduce anxiety while also improving your success for the semester! Once you have signed up for classes, I suggest creating a “map” of what your weekly schedule is going to look like. 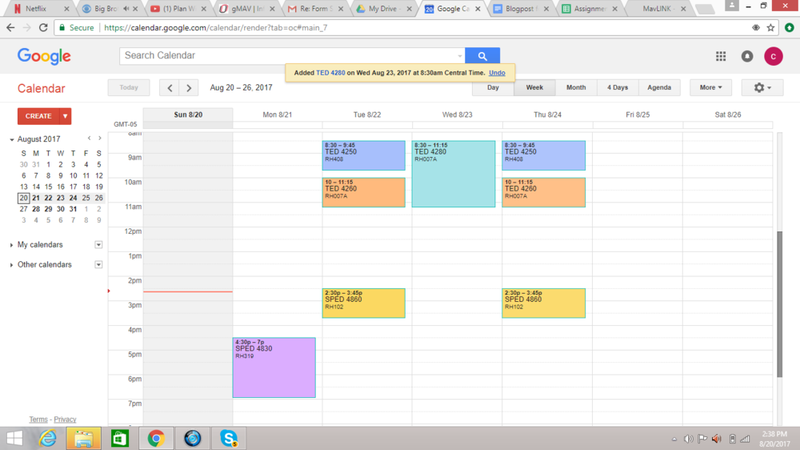 You could do this online via an app such as Google Calendar, or you could create a handwritten grid of your schedule. Having a visual of your classes and free time will allow you to see when you are in class and when you have time outside of class. From here you can start to think of the best times for you to study and work on assignments. For example, I have a 3 hour break twice a week between classes and I have already planned on using that time on campus to complete homework and assignments. I also put this schedule in my planner so that I can easily flip to it and see my schedule. 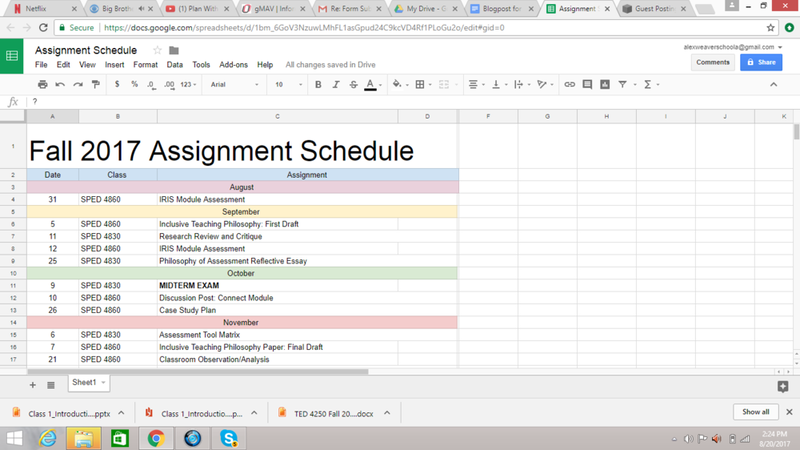 One of the newest things I have utilized for the upcoming semester is creating an assignment schedule. Once you have all of your syllabi for your classes you can begin to map out your entire semester based on due dates that are provided. I use google sheets, but you can also use a word document, excel, or a similar program. I color code the months, and categorize assignments based on the due date, class, and a description of the assignment. This digital schedule is easily accessible and shows a linear outlook on your semester. This can also be printed and put in your planner for more accessibility! Once you have mapped your class schedule and your assignment schedule, you can sit down and determine what tasks need priority on a week-to-week basis. I suggest doing this on Sunday or at the beginning of your week depending on your class schedule. You can use the same program for your assignment schedule or google calendar for this. Looking at your class schedule and referencing your assignment schedule, you can allot time during the week to complete assignments for that week or the upcoming week. This can keep you focused and on task during the semester by allowing you to visualize what assignments need to be completed when. This can also prevent procrastination, the more you plan and stick to your plan, the less you will be rushing assignments at the last minute. During the first week of classes you are typically given many forms, paperwork, and syllabi. What do you do with all of that? Instead of putting it in your backpack to be forgotten, create a system that can keep you organized all year. I use folders and binders to organize important forms that I do not want to lose. I have a folder for all of my class syllabi, a folder for assignment schedules (if provided), and a third folder for important paperwork that doesn’t fit with the other two. I keep all three folders in one binder and label it “Important Papers” or something similar. It’s easy to get swept up in the business of college life. For me, being constantly busy and working on assignments can cause me to stress out if I don’t have any free time. Over the last few years I have learned how important it is to plan out time to relax and rejuvenate yourself for the week. This can be anything from taking a bubble bath, doing your nails, taking a nap, relaxing and watching a movie or a tv show, anything that makes you excited and relaxed. This should be a time that you look forward to that motivates you to get work done; it is a reward for your own hard work. I schedule time usually on the weekend to do my nails and it is a calming and relaxing time for me to forget the stress of classes for a few hours! 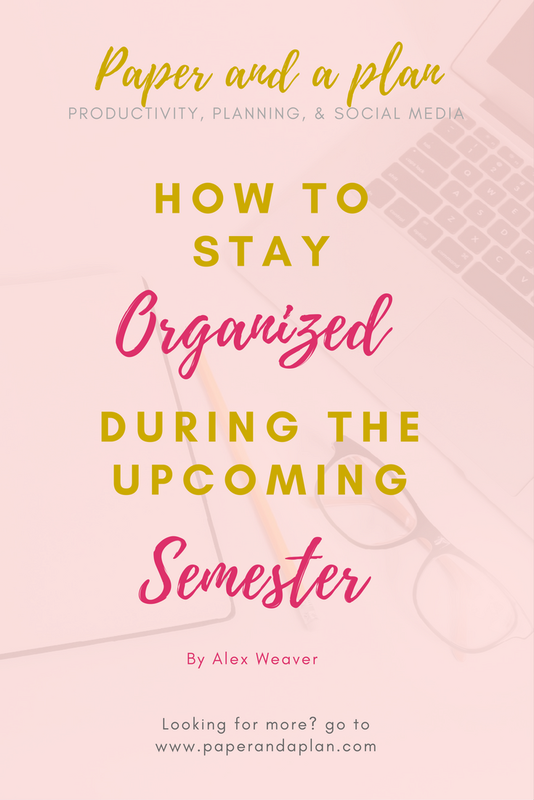 There are my most popular tips and tricks for preparing for a successful and organized semester. Many of these ideas are not originally my own; I combine a variety of strategies I have witnessed from many other people via pinterest, youtube, and instagram. These are great resources to look to if you want to learn more ways to organize and prepare for college, or life in general! I hope you take at least one of these tips and see how it can improve your semester. Good luck! Alex Weaver is a 21 year old college student in Omaha, Nebraska studying Early Childhood Education and aspires to be a teacher to young children. Alex utilizes her planner and other organization tips to ensure success in her classes. Her Instagram (@craftycollegestudent) shows her weekly planner spreads, crafty hauls, and more.